This has already been a fantastic year for competitive League of Legends, with all of the drama and excitement that kicked off back in January leading to this moment. This weekend, the three best teams in Europe will be battling it out in the Spring Split Finals in an attempt to bolster their position and strength on the road to Worlds. Do you want to know how to watch the League of Legends LEC Spring Split 2019 final? We’ve got all of the information for you right here. 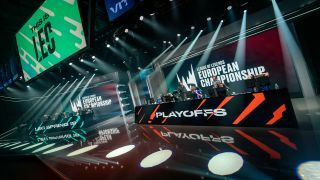 Riot overhauled the format of its European League of Legends professional league for this year, which means the Spring Split finals will see either G2, Fnatic or Origen crowned the very first victor of the LEC Finals. The main event is being held in Rotterdam, Netherlands, at the Ahoy Arena. Given that we're just 24 hours away from the action kicking off, the 15,000 capacity venue is now sold out across both days – meaning you’re going to get comfy at home if you want to catch any of it live. The official broadcast kicks off tomorrow, Saturday, 12 April, at 16:00 GMT (17:00 CEST/08:00 PT) but it can also be viewed on Riot’s YouTube channel – don’t forget to sign in and set yourself a reminder! – or over at Riot Games' Twitch channel. If you’re feeling particularly extra, why not grab a couple of friends and go see if a local cinema near you is showing it! Saturday will see the UK’s own Fnatic going head-to-head with Origen to secure a place in the Sunday Final against G2 Esports. That should prove to be a huge match; Origen finished the Spring season in second place with 12 wins and just six losses, though it was thoroughly picked apart by current Spring leaders G2 (edging ahead with 13W/5L) in last week’s Quarterfinals – a 3-0 decimation. Thanks to the overhauled Playoff format introduced this year, Origen now has the opportunity to claw its way back into the Final for a rematch against G2 following the thrashing. But it has got to get past Fnatic first – a team that finished fourth in the regular Spring standing, with 11W/7L – in tomorrow’s head-to-head. The winner of Origen V Fnatic game will face G2 on Sunday, 13 April, at 16:00 GMT (17:00 CEST/08:00 PT) and can be viewed from the same platforms as mentioned above. It's going to be one hell of a final, so be sure to stick with GamesRadar over the weekend as we cover all of the action as it unfolds, live from the Ahoy Arena in Rotterdam.